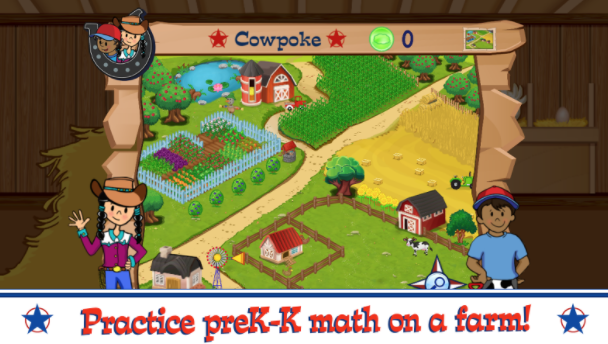 Explore the workings of a farm at The Kinder Corral as you practice your basic kindergarten math skills! Learn to write numbers 1-20 as you count your chickens - before they hatch! Use your targeting skills with the super hay launcher to count from numbers 1 - 100, filling the barn with hay! Help construct farm machines using basic shape recognition. Harvest vegetables as you prepare for market counting and making comparisons between number groups along the way! The Kinder Corral is a fun introduction to kindergarten mathematics! Kinder Corral is powered by Thinksy, with hundreds of thousands of questions covering kindergarten, 1st-grade, 2nd-grade, and 3rd-grade common-core math concepts. Thinksy-enabled games adapt to each player's skill and pace, meaning everyone's learning journey is unique! Experience fun and interactive educational games that keep parents connected and involved.